Maybe you aren’t ready to fully commit to a vegan lifestyle but you want to get more veggies in your diet. That’s admirable because most Americans aren’t eating most vegetables? When I went vegan, I got a reality check as to how many vegetables I was missing out on in my old diet. Also, when going vegan, I realized that it’s really not about the food itself, it’s more about the taste, temperature, and texture that’s most appetizing to my taste buds. Knowing how you like to consume food within the 3 T’s will allow you to eat almost anything. As an adult, you’ve probably made up your mind about the food you like and the food you don’t. Well there is a way to reprogram your taste buds, to allow yourself to try more vegetables and ultimately add them into your regular diet. If the taste of certain healthy foods is preventing you from consuming it, the oreo method may be right for you. 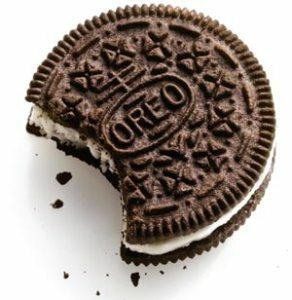 The oreo method works by biting into a food item you like, followed by the veggie you don’t like, and following that with the food you like. For example if you like nachos and dislike broccoli; you would take a bite of a nacho, immediately follow that up with a bite of broccoli, and then immediately follow that bite with another nacho. Beginning and ending with a familiar food will help you associate the taste of the foods you don’t like with something delicious and comforting. This can be an effective strategy for kids that are picky eaters as well. The more you use this strategy, the more healthy food you will enjoy eating. Overtime you’ll get used to the veggie without the sweet or savory food to go with it. Temperature can be very important in your perception of food. I have friends who tried a raw vegan diet and a big challenge for them is that everything is cold. Most people tend to gravitate toward warm food, so you can incorporate more veggies in your diet by adding it to warm foods like soup and pasta. You can also grill the veggies and add them to a salad or side dish to satisfy your temperature preference. I have a big preference for texture, which actually made it pretty easy for me to go vegan. Many vegetables and healthy foods, mimic traditional unhealthy foods and meats from a texture perspective. So these are easy swaps. The first step is identifying your texture preference; chewy, crispy, doughy, etc. Then, take a food you already like and mix in or substitute a healthier food. A common way that people do this today is by adding greens to smoothies. You can also puree vegetables like cauliflower and add it into mash potatoes and even into cheese (non-dairy for vegans of course) for a healthier grilled cheese. Posted on March 26, 2015, in Vegan Life and tagged eating more vegetables, food strategies, healthy foods, mix in method, oreo method, red hot methods, taste buds, vegan diet, vegan oreo, vegetables. Bookmark the permalink. Leave a comment.